Is this your first time making Thanksgiving Dinner for everyone? Or are you just looking for a less hectic Thanksgiving meal prep? Either way I’ve got you covered. 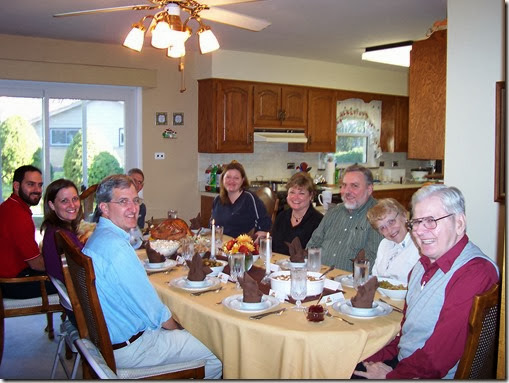 Here is What to make for Thanksgiving Dinner, Thanksgiving Recipes, Thanksgiving Timeline (when to put everything in the oven) and Thanksgiving Grocery List so that you can have a easy, seamless Thanksgiving Feast! Here is what we serve for Thanksgiving Dinner at our house. The meal serves 12-15 people with some leftovers. Links to all the recipes are below and everything else (including the editable Thanksgiving timeline and shopping list) is include in the free printable below. 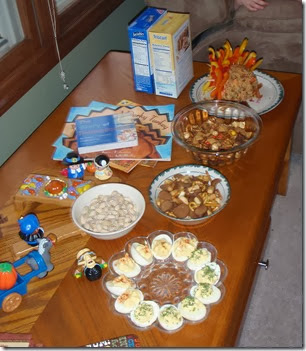 Along with the following appetizers, we always have our selection of Thanksgiving books and our Fisher Price Little People First Thanksgiving Set. We’ve also taken on the tradition that my Aunt started, we play BINGO! Everyone brings small wrapped prizes – the perfect game for 2 AND 72 year olds to play together! Thanksgiving is (believe it or not) relaxing for me. I assemble most of our dishes ahead and so I spend Thanksgiving actually playing with my kids and socializing. All I really have to do on Thanksgiving is throw things in and out of the oven. About 5 days before Thanksgiving (give or take) you’ll want to go to the grocery store. You’ll need about that long to defrost your Turkey. Plus the grocery stores just get crazier and crazier the closer you get to Thanksgiving (or any major holiday!) And if you’re taking little ones to the grocery store, don’t miss my free printable Learning at the Grocery store with fun educational activities for toddler, preschool, kindergarten, and 1st – 4th grade while at the grocery store. The day before you will want to pull out your table cloth, center piece (opt), and a serving dish & utensil for each and every thing you are serving. I label a post it note and put it in each serving dish. 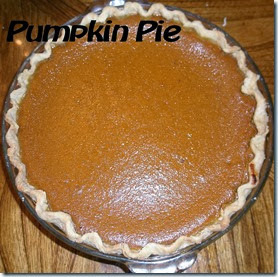 This makes serving it up on Thanksgiving go quicker and allows my husband and others to help me if I want the help. Are you using real dishes, china, or paper plates – do you have them on hand? 2:30 – Remove Turkey & Mix Salads. Put turkey on counter on top of trivet and cover with foil tent (this 15 minutes resting time allows the juices to stay inside keeping it juicy!) 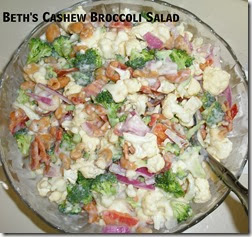 Change oven to 375 F . Mix together Broccoli & Cauliflower Salad and Chop apples & Snickers to add to Pudding Mix – put salads on the table. Recruit help to put ice/water in glasses. keep them warm. (i like to cook mine in ceramic dishes with glass lids). Bake Angel rolls for 10-12 minutes. 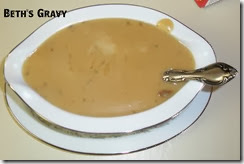 Start Gravy by whisking together 4 TAB butter and 4 TAB flour in a large nonstick skillet over medium heat. Sprinkle with salt & pepper and allow to cook until golden. Get turkey drippings and pour into gravy starter, whisking continuously. Now add 1 – 2 cups water continuing to whisk until a watery gravy appears. Now let boil over medium until thickens and you’re ready to serve. 2:50 Tell everyone to start wash hands and move towards the table & carve your turkey (I have my hubby do this). 3pm – Thanksgiving Turkey Dinner is served! Have someone else do the Thanksgiving dishes – it’s your turn to put your feet up! We usually have Thanksgiving leftover sandwiches for dinner and then make our Thanksgiving Leftover Soup with the Turkey carcass the next day – it is SO good!